Located at a distance of 16 km from Indira Gandhi International Airport and 6 km from India Gate, Hotel Ashoka Continental is a 2 star accommodation. 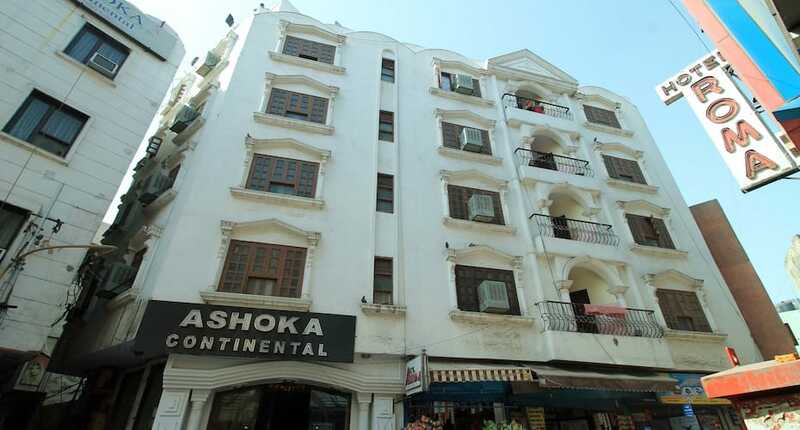 This property provides Wi-Fi connectivity within the premises.This 4 storey hotel in New Delhi consists of 80 spacious rooms. Each room is well-equipped with basic amenities like television, telephone, refrigerator, desk and an attached bathroom.Room service, front desk, travel desk, doctor on call and laundry are additional facilities available within the premises of this hotel in New Delhi.Hotel Ashoka Continental also provides airport/railway station pick up and drop facility on request. First night cost (including taxes & service charge) will be charged if you cancel this booking later than 22-Apr-19 12:00 PM IST. This is a double bedded room designed with marble floorings. The decor includes a writing desk, a sofa set and a wardrobe. A TV, a telephone and a mini-fridge are present in this room. This air-conditioned room is designed with sleek marble floorings and decorative false ceilings. The decor includes a double bed, a sofa with a coffee table, a dressing mirror, a wardrobe and a TV cabinet. The room is also maintained with a TV, a telephone and a mini-fridge. Spacious in its layout, this non-AC room can accommodate a family of four. The decor includes two double beds, a wardrobe with an attached mirror, couple of chairs and a TV stand. A TV, a telephone and a mini-fridge are also provided in this room. What's Good: Very dirty room and hotel staff very unprofessional and unpleasant. What's Good: It may be liked to stay here. What needs to improve : Worth to money. Reason For Rating : Not bed. Reason For Rating : Staffs services quite well but which room provided this was a worse quality.Walls and roof paints are falls in meals,water in everywhere. Even in the night I tried to cover my body with clothes. But,they don't response our repeated request for change the room. Dint know what was the reasons. Reason For Rating : Cost effective hotel for single stay . Reason For Rating : Hotel staff in not co-operative,do not show such kinds of hotel on your website...no customer satisfaction..worst hotel i have ever stayed. Reason For Rating : Very bad experience.. 1. Toilet was very dirty 2. Rude staff 3. Room was not clean at all. 4. Very worst service. What's Good: Too bad hotel, dirty toilets no toiletries, switches in room was broken , dirty bed sheet ,even window was broken . What's Good: Room are very dirty and smelling.Plz don't suggest me again. Budget hotel in busy paharganj area in delhi. room was not cleaned and bed sheets was also dirty. not advised to book this hotel only good thing about this hotel is that this is located centrally and very near to railway station. The hotel rooms are not very neat and clean. The service was at its worst. The light of our washroom was not working and when we asked them to replace it they evn did not bothered to replace it and instead gave lame excuses like it will take more 3-4 hours. Does it takes 3-4 hours to change a light? Also, the bedsheet was so untidy I found some hair in it. The very next day I changed my hotel and will not like to visit this place again.